In my last recipe post (Butternut Squash, Spinach and Gruyere Breakfast Bake) I admitted to going a little overboard on the spiralized vegetables at King’s Food Market. I suppose if you are going to over-do it, vegetables isn’t the worst thing in the world! It’s just great how versatile the vegetable becomes once it is in that spiral form. You can use it as a noodle, French fry or in today’s case, use it in a salad. 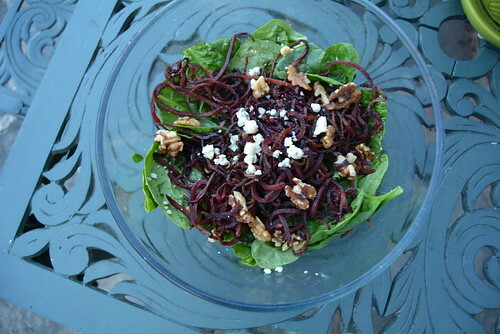 Today I’m featuring spiralized beets! This recipe is for an easy roasted beet salad with punchy gorgonzola and crunchy pecans. The beet is a great example of a vegetable where buying it pre-sprialized really gives you bang for your buck. Have you ever tried to work with a whole beet? They are difficult enough to peel but then working to spiralize them is a whole other story. While I try to save money where possible, the beet is one vegetable I’m willing to skip the work and splurge the extra couple of cents. Once it is spiralized the beet becomes super easy to work with. I decided to roast mine. However; a funny thing happened while roasting. I intended to cook until just tender, cool and then toss with my salad ingredients. Of course, I got distracted and did not set my oven alarm. They stayed in for about 7 minutes longer than I intended. But the results were one of those serendipitous things. The ends became crispy but not burnt. They were almost like beet chips. I was picking them up by the finger full and popping them in my mouth. What an even better salad topper, brittle beet chips! There were still plenty of strings that were tender but the duo of textures and flavors made it that much tastier. Preheat oven to 400 degrees. Toss spiralized beets with ¼ cup olive oil and tsp each of salt and pepper to coat. Put in a baking pan and roast for 35 minutes. Let beets cool for 30 minutes. Make the dressing. Mix 2/3 cup olive oil, ¼ cup balsamic vinegar, and ½ tsp each of salt and pepper in a bowl. Compose the salad. Add spinach, blue cheese, pecans, and cooled beets to a large serving bowl. Toss with as much salad dressing as desired.